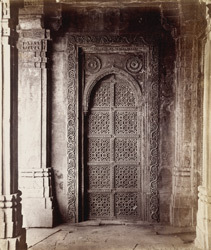 Photograph of a blind door in the courtyard of the Rani Ka Hajira, or Tombs of the Queens, at Ahmadabad in Gujarat, taken by Henry Cousens in the 1880s, for the Archaeological Survey of India. This tomb was built by Sultan Ahmad Shah (r.1411-1442) in c.1440, in a similar style to his tomb. It is a square enclosure with open colonnades around a raised platform. The central tomb is that of the wife of Muhammad Shah II and mother of Sultan Mahmud Begarha (r.1458-1511), Bibi Mughali. This is a view of a blind door carved with a geometric tracery screen in one of the compartments at the corners.